The young jackfruit cooked in coconut milk with spices that known as gudeg is the most popular Jogjanese food. There are two kinds of gudeg cooking. First is dry gudeg that cooked more than twice or overcooked. The colour is dark brown and the taste is sweet. The dry gudeg usually served with cassava leaf, dark brown boiled egg, and krecek, crisp beef rind. This food is popular as gift brought back from Jogja because the dry gudeg is very durable for 4 – 5 days. Different from the first type, the wet gudeg is cooked only once. The taste is not as sweet as the dry gudeg and served with areh, coconut milk that has been simmered until thick. Some people from other city commonly like this type because its taste more deliciously oily and salty. But they couldn’t brought back because wet gudeg is not durable. 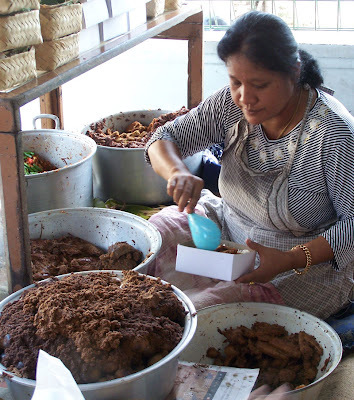 The Gudeg sellers are commonly come from Bulaksumur village, north of Jogja city. Before the University of Gadjah Mada was built at Bulaksumur, the jackfruit plants thrive on this village. Then the villagers not only cooked the young jackfruit for their family but also peddled the Gudeg to other places of Jogja city. Some people from Bulaksumur village have no permanent gudeg stall. Every morning they paddled their bike that carried gudeg food. They sell the gudeg at the sidewalk. In the afternoon, when the food sold out, they back home to prepare the food that will be sell at night. Nowadays, we could find gudeg in 24 hours a day. Gudeg stalls at kampong Barek - Bu-laksumur are commonly open in the early morning. At noon, we could visit kampong Wijilan near the Kraton to get gudeg for lunch. In the evening, gudeg stalls are easily to find in Jogja main roads, like Jl. Malioboro, Jl. Bigjend Katamso, Jl. Solo. Jl. P. Mangkubumi, Jl. Sultan Agung, etc. The night gudeg stalls are known as warung lese-han, stall that spread out on the ground. Even, in the middle of the night, we could enjoyed gudeg in gudeg pawon at Jl. Kusumanegara.